Scooby-Doo (also known as Scooby-Doo: The Movie) is a 2002 American live-action/computer-animated family adventure film based on the long-running Hanna-Barbera animated television series of the same name. 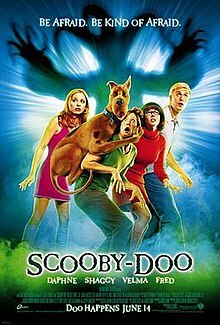 It is the first installment in the Scooby-Doo live-action film series, directed by Raja Gosnell, written by James Gunn, and starring Freddie Prinze Jr., Sarah Michelle Gellar, Matthew Lillard, Linda Cardellini and Rowan Atkinson. The plot revolves around Mystery Incorporated, a group of four young adults and a dog who solve mysteries, who reunite after a two-year disbandment, to investigate a mystery on a popular horror resort. Filming took place in and around Queensland on a budget of $84 million. The film was released on June 14, 2002, and grossed $275 million worldwide. Reggae artist Shaggy and rock group MxPx performed different versions of the Scooby-Doo, Where Are You! theme song. The Scooby-Doo Spooky Coaster, a ride based on the film, was built in Warner Bros. Movie World in Gold Coast, Australia in 2003. This is the last time William Hanna served as the executive producer before his death on March 22, 2001. A sequel, Scooby-Doo 2: Monsters Unleashed, was released in March 2004. The members of Mystery, Inc. solve the case of the Luna Ghost. However, long-time friction among Fred Jones, a glory hog; Daphne Blake, who is fed up with being kidnapped at every mystery; and Velma Dinkley, who is never credited for her ideas, finally boils over and the gang breaks up, leaving Shaggy Rogers and his dog Scooby-Doo heartbroken. Two years later, Shaggy and Scooby are invited to solve a mystery on the popular resort Spooky Island, owned by Emile Mondavarious. At the airport, the pair is unexpectedly reunited with the rest of Mystery, Inc.—Fred has become a popular author, Velma works for NASA, and Daphne has undertaken martial arts to avoid kidnappers. However, while Shaggy and Scooby are thrilled with the reunion, the other three still refuse to work with each other. On the flight over, Shaggy falls in love with a girl named Mary Jane, who loves Scooby Snacks like him, but is allergic to dogs. Upon arriving at the island, the gang meets Mondavarious, who claims the visiting tourists have been cursed into a brainwashed state. Velma attends a ritualistic performance hosted by N'Goo Tuana and his henchman, Zarkos, a famous luchador. N'Goo claims the island was once ruled by ancient demons that have been plotting their revenge ever since they were displaced when Mondavarious built the resort. Because of a misunderstanding when talking to a local voodoo priest, Daphne, Shaggy, and Scooby venture into the resort's ghost ride and meet Fred and Velma inside, where they split up to look for clues. Fred and Velma come across a strange school designed to educate inhuman creatures about human culture, while Daphne discovers a pyramid-shaped artifact called the Daemon Ritus. The gang flees to the hotel, but an army of real demons attack, kidnapping Fred, Velma, Mondavarious and other tourists, while Scooby, Shaggy, Daphne and Mary Jane escape. The next day, Daphne is captured by Zarkos, and steals the Daemon Ritus. Shaggy and Scooby learn that demons have possessed Fred, Velma and the other tourists. They encounter Mary Jane, but Scooby realizes she is possessed as well. Shaggy begins to argue, but is interrupted when Scooby falls through a hole into an underground chamber. While searching for him, Shaggy discovers a vat of protoplasm containing the souls of those possessed. He frees Velma, Fred, and Daphne's souls. Velma discovers the demons can be destroyed by sunlight, but Fred and Daphne become trapped in each other's incorrect bodies until the Daemon Ritus corrects this. They come across the voodoo priest, who explains that the demons, whose leader turns out to be Modavarious, will rule the world for the next ten-thousand years if a pure soul is offered as a sacrifice during their ritual. Shaggy realizes the pure soul is Scooby, who unwittingly accepts to be the sacrifice, having no idea what a sacrifice is. While curious on why Mondavarious invited them too, Fred, Daphne and Velma decide to put the past behind them in order to help Shaggy save Scooby. The gang plot a trap to defeat the demon cult, but it fails and Mondavarious steals Scooby's soul using the Daemon Ritus. Shaggy then tackles Mondavarious, causing Scooby's soul to be released. As Fred and Velma confront the defeated Mondavarious, they find that he is wearing a mask. When Fred peels the mask off, they discover Mondavarious is a robot controlled by none other than Scooby's estranged nephew Scrappy-Doo, who was abandoned by the gang years ago after he demanded to be the new gang leader and urinated on Daphne. Using the absorbed souls of the tourists, Scrappy transforms into a monster and tries to kill the gang, explaining that he brought them to the island so he could get revenge on them. On the mountain top, Daphne battles Zarkos, finally kicking him into disturbing the ritual chamber where the demons are exposed to a disco skull's sunlight reflection and die, freeing the souls they possessed. Shaggy rips the Daemon Ritus from Scrappy's body to free the rest and finds out that the real Mondavarious is found imprisoned in a small underground cell. Scrappy, N'Goo, Zarkos and all minions are arrested, while the reunited gang promise to forever solve mysteries. As the end credits begin to roll, Scooby and Shaggy are enjoying the "all you can eat" deal they were promised at the hotel. They challenge each other with eating chili peppers but scream as smoke emerges from the hotel. Producer Charles Roven began developing a live-action treatment of Scooby-Doo in 1994. By the end of the decade, the combined popularity of Scooby-Doo, Where Are You!, along with the addition of the script and updated digital animation led Warner Bros. to fast track production of the film. 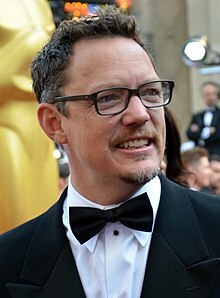 In October 2000, the film was officially given the green light, Variety reported that Raja Gosnell had been hired to direct the film. The movie was filmed on location in and around Queensland, Australia. Production was started on February 12, 2001 at the Warner Bros. Movie World theme park, and wrapped in June 2001. The film was originally set to have a much darker tone, essentially poking fun at the original series, much like The Brady Bunch Movie, and was set for a PG-13 rating. Shaggy was set to be a stoner, and there were many marijuana references. Several rumors about these aspects in the original cartoon series were passed around by fans of the original and were to be incorporated into the live action film. In March 2001, one month into filming, the first official cast picture was released. According to actress Sarah Michelle Gellar, after the cast had signed on there was a change, and the film became more family friendly, though some of the original adult jokes are still in the film. They are also included in deleted scenes on the home media releases. Gellar also said her character and Linda Cardellini's shared an onscreen kiss that did not make the final film. "It wasn't just, like, for fun," she said, explaining it took place in the body-switching scene. "Initially in the soul-swapping scene Velma and Daphne couldn't seem to get their souls back together in the woods. And so the way they found was to kiss and the souls went back into proper alignment." In 2017, the 15th anniversary of the release of the film, James Gunn, the screenwriter for the movie, revealed in a Facebook post that there was an R-rated cut of Scooby-Doo and that CGI was used to remove cleavage of the female cast members. Actors Freddie Prinze Jr. and Sarah Michelle Gellar, who portray Fred and Daphne and are romantically involved in the film and series, became real-life husband and wife shortly after the film was released. When asked about watching several cartoons before playing Shaggy, Lillard responded, "Everything I could get my hands on. If I ever have to see another episode of Scooby-Doo, it will be way too soon." Lillard would continue voicing Shaggy in the rest of the Scooby-Doo media. Jim Carrey was originally attached to play Shaggy, while Mike Myers also expressed interest in playing Shaggy. In January 2001, it was reported that Rowan Atkinson was in negotiations to play Mondavarious. Prinze said of his character, "[He] always showed more arrogance than everyone else. So in the movie, I took the opportunity to make him as narcissistic and self-loving as possible." Fisher grew up watching Scooby-Doo in Australia, and said that the "best part of making this movie was being part of an institution, something that has been in people's childhoods and is something that means a lot to a lot of people." Cardellini was also a fan of the Scooby-Doo series. The film's score was composed by David Newman. A soundtrack was released on June 4, 2002, by Atlantic Records. It peaked at number 24 on the Billboard 200 and 49 on the Top R&B/Hip-Hop Albums. Shaggy performs the theme song from Scooby-Doo, Where Are You!, which was retitled "Shaggy, Where Are You?". A video game based upon the film was released for Game Boy Advance shortly before the film was released. The game is played in third-person point of view and has multiple puzzle games and mini-games. The game's structure was similar to a board game. Metacritic rated it 64/100 based on five reviews, which they labeled as "mixed or average reviews". The film was released on VHS and DVD on October 11, 2002. The release included deleted scenes, among them an alternate opening animated in the style of the original television series. It was later released as a double feature with its sequel on Blu-ray on November 9, 2010. Scooby-Doo debuted with $19.2 million on its opening day, and $54.1 million over the weekend from 3,447 theaters, averaging about $15,711 per venue and ranked No. 1 at the box office. The film closed on October 31, 2002, with a final gross of $153 million in the United States and Canada. It made an additional $122 million in other territories, bringing the total worldwide gross to $275.7 million, making it the 15th most successful film worldwide of 2002. The film was released in the United Kingdom on July 12, 2002, and topped the country's box office for the next two weekends, before being dethroned by Austin Powers in Goldmember. On Rotten Tomatoes, the film has an approval rating of 30% based on 143 reviews and an average rating of 4.4/10. The site's critical consensus reads, "Though Lillard is uncannily spot-on as Shaggy, Scooby-Doo is a tired live-action update, filled with lame jokes." On Metacritic, the film has a score of 35 out of 100 based on 31 critics, indicating "generally unfavorable reviews". Audiences polled by CinemaScore gave the film an average grade of "B+" on an A+ to F scale. Roger Ebert of the Chicago Sun-Times gave the film one out of four stars, stating that the film "exists in a closed universe, and the rest of us are aliens. The Internet was invented so that you can find someone else's review of Scooby-Doo. Start surfing." Peter Travers of Rolling Stone said, "Get out your pooper-scoopers. Doo happens June 14th, warn the ads for Scooby-Doo. And they say there's no truth in Hollywood." Robin Rauzi of the Los Angeles Times called the film "entertainment more disposable than Hanna-Barbera's half-hour cartoons ever were." Although Jay Boyar of the Orlando Sentinel said that children who liked the animated version of Scooby-Doo will "probably like" the film, he urged parents to "know that the violence is a bit harder-edged than in the cartoon version". He would later go on to say that adults who remember the cartoon version "may get caught up in what Scooby would call the 'rostalgia'", but said that "adults who do not fondly recall the Scooby-Doo cartoons are strongly advised to steer clear." Conversely, Hank Struever of The Washington Post gave the film a positive review, stating that "You don't want to love this, but you will. Although Scooby-Doo falls far short of becoming the Blazing Saddles of Generations X, Y and Z, it is hard to resist in its moronic charms." Gellar won Choice Movie Actress – Comedy at the Teen Choice Awards. Prinze was nominated for a Golden Raspberry Award (Razzie) for Worst Supporting Actor, but he lost to Hayden Christensen for Star Wars: Episode II – Attack of the Clones. It was also nominated for another Razzie, Most Flatulent Teen-Targeted Movie, but lost against Jackass: The Movie. A sequel, Scooby-Doo 2: Monsters Unleashed, was released in 2004. It was then followed by two telefilm prequels: Scooby-Doo! The Mystery Begins and Scooby-Doo! Curse of the Lake Monster, which both aired on Cartoon Network in 2009 and 2010 respectively. A spin-off film Daphne & Velma was released on May 22, 2018, and an animated reboot will be released on May 15, 2020. ^ "Scooby-Doo 1 & 2 Collection". Amazon.com. November 9, 2010. ^ a b "Scooby-Doo (2002)". Box Office Mojo. Retrieved November 26, 2016. ^ "Scooby-Doo". IMDb. June 14, 2002. ^ Dayna Van Buskirk, Reg Seeton (March 1, 2004). "Unleashing Monsters & Zombies". UGO. Retrieved April 23, 2008. ^ a b c Mallory, Mike (May 5, 2002). "What Will Scooby Do?". Los Angeles Times. Retrieved December 21, 2011. ^ "Scooby film gets go-ahead". BBC. October 17, 2000. Retrieved December 29, 2016. ^ Warner Bros. (March 5, 2001). "Production underway on live-action 'Scooby Doo', Starring Freddie Prinze Jr., Sarah Michelle Gellar and Rowan Atkinson for Warner Bros. Pictures" (Press release). Burbank, California. Retrieved December 21, 2011. ^ Sigesmund, B.J. "The Inside Dope". Newsweek. June 14, 2002. Available at Lexis-Nexis. ^ "Scooby-Doo, where are you?". BBC. March 8, 2001. Retrieved December 29, 2016. ^ "Sarah Michelle: The Buffy Slayer". Marie Claire, November 2006. Vol. 13, Issue 11. Page 100. ^ "'Scooby Doo' Was Initially Rated R, Says James Gunn". TheWrap. June 15, 2017. Retrieved June 16, 2017. ^ "James Gunn Says First Cut Of 'Scooby-Doo' Movie Was Rated R". Archived from the original on June 16, 2017. Retrieved June 16, 2017. ^ "James Gunn Confirms 'Scooby-Doo' Was Originally Given an R-Rating". Entertainment Weekly. June 15, 2017. Retrieved June 16, 2017. ^ a b Murray, Rebecca. ""Scooby-Doo" Movie Premiere – Quotes From the Red Carpet". About.com. p. 1. Retrieved December 17, 2012. ^ "Rowan Atkinson turns bad for Scooby-Doo". The Guardian. January 30, 2001. Retrieved December 29, 2016. ^ Murray, Rebecca. ""Scooby-Doo" Movie Premiere – Quotes From the Red Carpet". About.com. p. 3. Retrieved December 17, 2012. ^ Murray, Rebecca. ""Scooby-Doo" Movie Premiere – Quotes From the Red Carpet". About.com. p. 2. Retrieved December 17, 2012. ^ Harris, Craig (June 5, 2002). "Do the Doo". IGN. Retrieved November 27, 2016. ^ "Scooby Doo". Metacritic. Retrieved November 27, 2016. ^ "'Scooby-Doo/Scooby-Doo 2: Monsters Unleashed' Announced for Blu-ray". High-Def Digest. August 18, 2012. Retrieved November 5, 2012. ^ Karger, Dave (June 17, 2002). "Just 'Doo' It". Entertainment Weekly. Retrieved December 17, 2012. ^ "Weekend box office 12th July 2002 – 14th July 2002". 25thframe.co.uk. Retrieved December 29, 2016. ^ "Weekend box office 19th July 2002 – 21st July 2002". 25thframe.co.uk. Retrieved December 29, 2016. ^ "Scooby-Doo descends on UK". BBC. July 12, 2002. Retrieved December 29, 2016. ^ "Scooby-Doo (2002)". Rotten Tomatoes. ^ "Scooby-Doo (2002) Reviews". Metacritic. ^ Ebert, Roger (June 14, 2012). "Scooby-Doo". Chicago Sun-Times. Retrieved December 17, 2012. ^ Travers, Peter (December 5, 2012). "Scooby-Doo". Rolling Stone. Retrieved December 17, 2012. ^ Rauzi, Robin (June 14, 2002). "'Scooby-Doo,' Where Are You?". Los Angeles Times. Retrieved December 17, 2012. ^ Boyar, Jay (June 14, 2002). "Live-action 'Scooby-doo' – That Dog Just Won't Hunt". Orlando Sentinel. Retrieved December 17, 2012. ^ Struever, Hank (June 14, 2002). "'Scooby-Doo': There's Nothing to Do but Dig It". The Washington Post. Retrieved December 17, 2012. ^ "Teen Choice Awards 2002: Complete Winners List". Hollywood.com. August 4, 2002. Retrieved September 27, 2014. ^ McNary, Dave (May 4, 2017). "Scooby-Doo Animated Movie Moves Back Two Years to 2020".